THEREFORE BE IT RESOLVED that the South of Fraser must build compact, transit-oriented, walkable, and bicycle-friendly neighbourhoods that include a wide range of housing choices, and that the South of Fraser communities must support high-quality transit such as light rail to reduce auto dependence. South Fraser OnTrax would like to invite you to attend a debate on whether or not Smart Growth principles are needed in the South of the Fraser. Todd Litman of the Victoria Transport Policy Institute, whose research has been used by governments worldwide, will be debating Randal O'Toole who is a Senior Fellow at the Cato Institute and who has also taught environmental economics at Yale, UC Berkeley, and Utah State University on the future of land-use and transportation planning in the South of Fraser. Litman is a strong proponent of smart growth principals and high-quality public transit while O’Toole has been an outspoken critic. O’Toole is best known for being critical of the Portland model of land-use planning and implementation of light rail. Litman is best known for his research including the Online TDM [Transportation Demand Management] Encyclopedia. This free event is open to all members of the public, who will have the chance to hear both sides of the debate and have the opportunity to question Litman and O’Toole. Seating is limited and reservations are recommended. Please visit southfraser.net for more information and email southfraserblog@yahoo.com to reserve your seat. 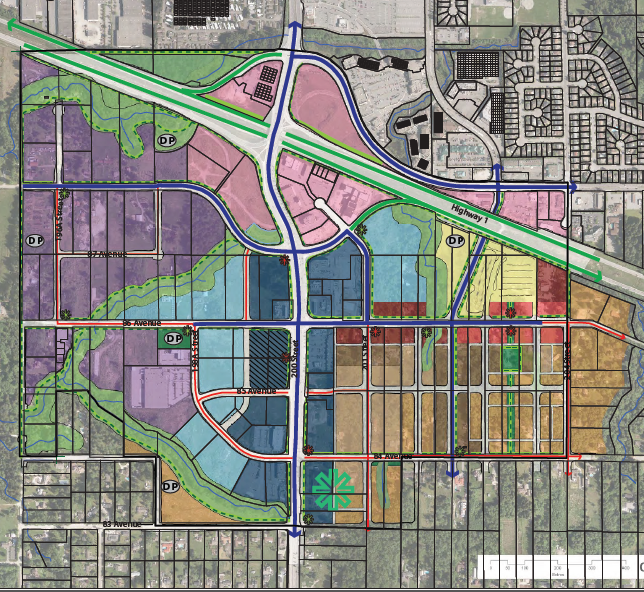 Carvolth Plan Update -Mixed-use coming to 200th Street Corridor? It’s amazing how one park and ride lot can reshape an entire neighbourhood. 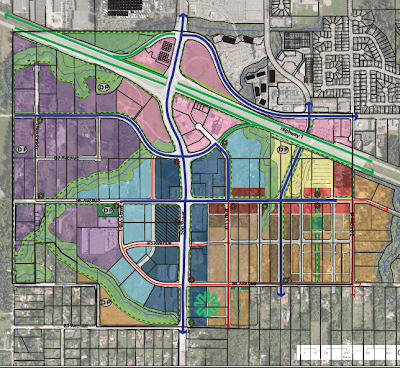 In November, I posted about an update to the plan for the Carvolth neighbourhood near Highway 1 along the 200th Street corridor. Currently the neighbourhood is doomed to be a “light-industrial” or warehouse district for the Township of Langley. Due to the new park and ride facility being constructed at 202nd Street, the Township wanted to update the plan. Back in November, I liked an early concept for the neighbourhood called “Transit Nodes”. At Monday afternoon’s council meeting, Township Staff presented the final draft version of the plan that will go out for public open house in the next month or so. The new plan is a modified version of the “Transit Nodes” concept. Overall I’m fairly impressed with this plan, especially with the plan’s mixed-use future for the lands on the east side of 200th Street. On the west side of 200th Street I’m happy that the Township is looking for mixed-use office/retail, but I have to wonder why “light-industrial” use is back on the plan. I know the Township’s Economic Development Advisory Committee has commented in the past that light-industrial land use is the least economically productive use of land. I’d certainly like to see the light-industrial purple on the plan changed to office blue or mixed-use. With a few tweaks to the plan, I can’t wait to see how 200th Street will now start to develop into a transit corridor and 86th Avenue into a high retail street. Every quarter the American Public Transportation Association releases ridership statistic on transit agencies in Canada and the US. TransLink reports into APTA. In 2010, TransLink saw 39% growth in ridership on its SkyTrain and Canada Line network while it saw a modest 2% increase in bus and a 3.7% decrease in trolley bus ridership. Up until the third quarter of 2011, TransLink actually saw a modest 1.26% increase in ridership on the SkyTrain and Canada Line, but a further 0.7% decline in trolley bus usage and a 0.3% decrease in regular bus usage. While the huge growth in rail-based ridership in 2010 was attributed to the Olympics, it is very interesting that TransLink was able to retain all those transit users. In comparison, the trolley bus system and SeaBus (which saw a 8% decrease through the third quarter of 2011) was not successful in capturing new riders. It looks like people really do prefer trains over buses. On the topic of trolley buses, it’s interesting to note that since 2008 trolley bus ridership has been on the decline. 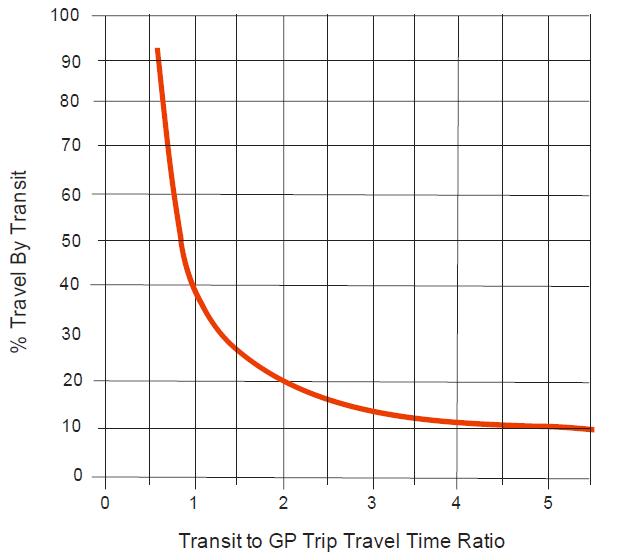 Since these buses only run in Vancouver, has the city seen a flattening out of transit users or peak transit? By the same metric when the Canada Line came online which services “the suburbs”, there was an explosion of growth in transit usage. There are many in Vancouver that do not see beyond Boundary Road and want transit improvements just for themselves. But if these ridership stats are any indication, TransLink will see a more meaning shift of people to transit if they invest in communities like Surrey. 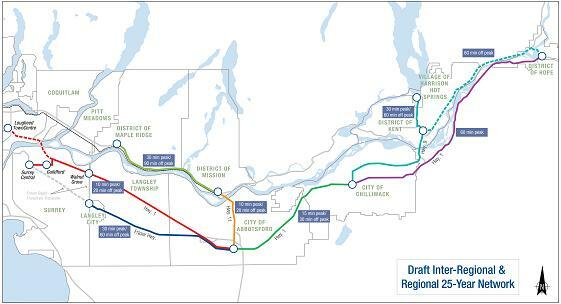 In my mind if there is a debate between Surrey or Vancouver getting rapid-transit first, the clear winner should be Surrey. One of the things that makes me proud about BC is our leadership on recycling. In the next few years, there will be practically no reason why household waste shoud end up in a landfill. I received the following press release in my inbox last night about a recycling trial in the City of Langley. In a few years, we'll finally be able to recycling all that annoying packaging on products. Of course it would be better if there was less packaging used period, but this is a great start. For 800 homes in the City of Langley, curbside recycling will work a little differently during a 12-week test recycling project running from February 7 through April 27, 2012. The temporary change in the recycling program for this group of householders stems from the provincial government’s recent amendment to the Recycling Regulation to include the Packaging and Printed Paper Product Category. The regulation requires that product producers be responsible for their packaging after consumers have purchased the products. This new product and packaging stewardship program prescribed under the regulation will come into effect on May 19, 2014. In anticipation of this legislated change, the City has been asked to help test a potential collection system. “The City of Langley has partnered with our recycling company, Emterra Environmental, the Canadian Plastics Industry Association and a number of plastics manufacturing companies to test the collection and processing system for empty plastic bags, plastic overwrap and foam packaging. The test will be conducted in a controlled environment in order to assess the systems that are needed to collect, process and market these materials, according to the requirements of the regulation. This is a first-of-its-kind test in B.C. and we are excited that our City has been asked to participate in the test recycling project,” Mayor Peter Fassbender announced today. For the duration of the test, from Tuesday, February 7 through Friday, April 27, householders in the test areas will collect plastic bags, plastic overwrap (clear wrap used for large packages of bathroom tissue, paper towels, cases of beverages, etc.) and foam containers and packaging for recycling instead of disposing of these materials in the garbage. They willl be asked to put empty plastic bags and overwrap into a blue, see-through recycling bag and empty foam containers and packaging into a second recycling bag. When a bag is full, they’ll set it out with their regular recycling. Emterra Environmental will collect the special recycling bags along with the regular recyclables to test various aspects of collecting and processing the materials. When I got on the bus at Guildford Town Centre heading towards Surrey Central yesterday afternoon, I never expected to see someone get robbed one-foot in front of me. Somewhere after going past the high-voltage power lines on 104th Avenue, two white young-adult males and their “girlfriends” got on the bus. These are the kind of people that don’t pay their transit fare. They proceeded to the back of the bus and on the way smacked into another women full-force. They joked about how funny it was to hurt her. Next they set their eyes on the only black person on the bus. I don’t think that it is any coincidence that they targeted a minority. Anyway, they asked the teen if he had an iPod/iPhone because they saw his headphones. After threatening the teenager, they told him that he better hand over his Blackberry. The teen complied. There were about 10 people in the back of the bus that saw this go down. Next, they asked him to empty out his pockets and proceeded to steel his transit tickets. It was at this time that the wannabe thugs asked me if I had anything to give them. I said no and they didn’t bug me after that. They proceeded to rummage through the teen’s backpack. When the bus was nearing Surrey Central, and I got off and called 911. The teen had a friend with him who also called 911. The good news is that the police caught the bullies and they are appearing in court today. The RCMP is recommending a charge of robbery and I hope the Crown agrees. Robbery is classified as a violent crime. The whole incident left me a bit rattled for a number of reasons. First, I was almost the victim of crime yesterday. I’ve had my house broken into and (when I had a car) my car broken into in the past. I got over those pretty fast, but there is nothing quit as scary as someone threatening you. I learned yesterday that I’m a runner, not a fighter. Second, the bullies weren’t trying to steal from the teen because they wanted an iPhone. They stole from him to degrade and humiliate. That was probably the most shocking thing for me. What kind of person gets off humiliating someone half their size? Third, I was the only 3rd party (beside the teen’s friend) that saw the crime, called 911, went to the RCMP, and gave a statement. What kind of society do we live in when people turn a blind eye to bullying? Finally, this happened around 4:30pm on a busy bus route on a Sunday! I’ve taking transit full-time for about 5 years in the South of Fraser. I’ve seen stupid things at night on the bus, but I’ve never anything like this. It was a braze crime given the fact that it was committed in broad daylight and in front of so many people. Yesterday's crime got me thinking about how TransLink could make buses safer. TransLink is in the process of installing camera on all their buses. This is a good thing and helps put people in jail after the fact. But when a crime is taking place, cameras do nothing. When I saw the teen getting robbed yesterday I wanted to do something fast, but I didn’t want to become the next crime statistic in Surrey. It takes about 30 seconds from the time you call 911, to the time you get to Surrey dispatch. That is enough time for your phone to be removed from your person by a criminal. There needs to be a way to silently alert police or TransLink to the fact that I crime is taking place on a bus. I didn't feel safe going to the bus driver. In this day and age, you should be able to text the police or something. The second thing I noticed is that wannabe thugs don’t pay their transit fare. While TransLink inspects fares all the time on SkyTrain, I can only remember a couple of times that I’ve ever been checked for a fare on a bus in Surrey. There needs to be better fare enforcement on the bus because right now I don’t think TransLink is taking fare evasion on buses in Surrey seriously. Yesterday was a pretty scary day for me, but I’m not going to stop taking transit or going to Surrey. 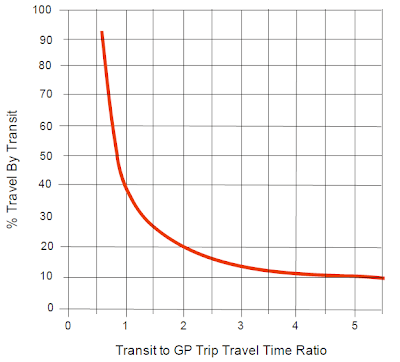 Considering that I take thousands of transit trips every year, statically transit is still the safest form of transportation. TransLink does need to provide better security on buses in Surrey, does need to implement a silent alert system, and does need to enforce fare payment on its buses. I hope this post does not fall on deaf ears. 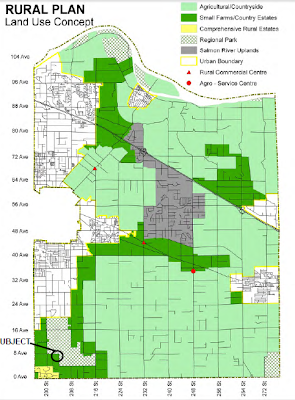 One of the problems with using the Agricultural Land Reserve as an urban growth boundary is that there is some land in the ALR that probably shouldn’t be. This is why I support Metro Vancouver’s new urban growth boundary. Speaking about the ALR, at the Monday afternoon Township of Langley council meeting two sub-divisions in the ALR where waiting for endorsement. Recommendation that Council advise the Agricultural Land Commission that the subdivision application submitted by Gordon and Ingrid Holscher for property located at 759 - 204 Street, within the Agricultural Land Reserve is supported as it complies with the minimum lot size requirements of the Small Farms/Country Estates designation of the Rural Plan and Township Zoning Bylaw, subject to compliance with the requirements of the Agricultural Land Commission, and at time of subdivision, the Township of Langley’s Subdivision and Development Servicing Bylaw. Recommendation that Council advise the Agricultural Land Commission that the subdivision application submitted by Peter and Lillian Riley for property located at 21980 – 100 Avenue, within the Agricultural Land Reserve is supported as it complies with the minimum lot size requirements of the Small Farms/Country Estates designation of the Rural Plan and Township Zoning Bylaw, subject to compliance with the requirements of the Agricultural Land Commission, and at time of subdivision, the Township of Langley’s Subdivision and Development Servicing Bylaw. The Township of Langley has a zone called “Small Farms/Country Estates” which is basically the ultimate suburban zoning. The zoning is for “hobby farms” (wink, wink) on lots around the 4 acres mark. On the bright side, it does provide for an urban/rural interface. Langley's Rural Plan. Dark green is Small Farms/Country Estates zone. Click image to enlarge. In other news, it looks like the Brookswood Merchants Association is looking to improve their community. In May of last year, a 748 person petition was signed by residents wanting safety improvement around 40A Avenue and 200B Street. In response, the Township installed a painted walkways, installed new way finding, painted a yellow line on the road, and will do some minor street repair this spring. It looks like the Brookswood Merchants Association is happy with these changes, but is now looking for sidewalks, streetlights, and underground utilities. I know that the Township is about to start the process of updating the community plan for Brookswood, but I wonder if the merchants can wait that long. Let’s hope they don’t pull a “City of Langley” and start their own municipality! Today I thought I'd look a total revenue received from local governments in the South of Fraser. These numbers represent total revenue from all sources like from seniors levels of government; this is not just property tax. When you look at school districts it appears that the more population a district has, the less per capita revenue it receives. The over-crowded Surrey school district is at the bottom of the list. On the municipal side of things, Surrey once again is at the bottom of the list. This is either good news or bad news. The good news is that Surrey is the most cost effective city to live in, but it receives the least revenue per citizen which might mean less services per citizen. The City of Langley receives the most revenue per citizen and that might have something to do with the effect of its large casino in the relatively small community. 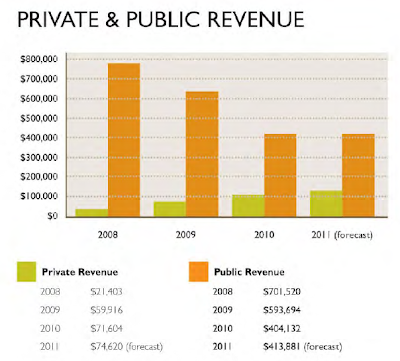 At the end of the day, it's actually very interesting that municipal government revenue is within 23% of each other. When I looked at the numbers, I didn't realize how much money is spent on education. School District budgets are pretty close to municipal budgets. When talking about the South of Fraser sub-region, we don’t seem to talk too much about First Nations with perhaps the exception of the Tsawwassen First Nation. For example, did you know that there are at least 5 First Nations in the South of Fraser according to the federal government? A friend of mine was chatting about Attawapiskat and told me that he hoped that something as tragic and regrettable does not happen here. Before I go any further, I should be clear that I’m not suggesting something like that is happening in the South of Fraser, but I thought I’d take a look at federal government funding to First Nation groups. Looking at the most recent information available this is what I found for annual spending. I should also note that this pays for education, health-care, and local government service. The first thing that stuck out to me was the amount of funding for the Tsawwassen First Nation, but if you look a little deeper you can see that this has to do with the fact that this is funding to help setup their self-government. I will also note that the Tsawwassen First Nation has more financial information on their website than others. Also, interesting to note is that funding levels are different for every First Nations group. The main challenge about looking any deeper is that information is not readily available. It seems to me that there isn’t the same amount of transparency as other governments in Canada. The federal government has introduced the First Nations Financial Transparency Act and it appear to be a step in the right direction, but we’ll have to wait and see. When I was a police officer people judged our effectiveness by whether crime was up or down. The problem with this indicator are many fold. Can you measure how much crime was deterred by the police and their proactive patrols? What about that single arrest that I made which solved 265 other crimes and recovered some stolen property? Do you count this as good or bad? Sorry to use crime as an analogy, but several people oppose Tourism Langley because of the Hotel Tax, which some think is criminal. I know that Wally Martin's objections to Tourism Langley began because of our 2% municipal Hotel Tax. The levy is on all accommodations that cost more than $30, excluding tents and accommodations on trains or boats during a journey. Wally owns a 6 room B&B in Murrayville and felt his accommodations should be exempt. I tend to agree with him when it comes to small B&B's. I recently went to Victoria on business. Their Hotel Tax is 8%, plus another 2% Municipal Tax, plus HST. What would Langley hoteliers say about a 10% tax instead of 2%? What about those 28% Hotel Taxes in the USA and overseas? Just like economic development, parks & recreation and a host of other community jewels, someone has to be there to fly the flag and promote tourism. BUT, Tourism Langley does much more than this. I know that over the past few years, Tourism Langley staff have taken courses on how to prepare bid documents for large events, like the BC Summer Games, the BC Senior Games and others. Staff of Tourism Langley then went out and helped various groups "bid" for these large-scale events. Special events like the BC Summer Games and BC Senior Games bring in hundreds of thousands of dollars to our local economy and include hotel rooms, restaurant meals, local shopping and much more. Are these dollars contained in the stats for Tourism Langley? NO, they are not. 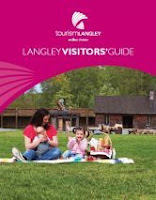 Can Tourism Langley capture in their stats everyone who accessed their website and came to Langley as a result of what they saw? What about the series of very professional brochures covering Art, Local Wines, Food, Agriculture, Heritage and much more. Do we know how many tourists and how much money came to Langley because of these excellent publications? NO, we do not. When Tourism Langley's series of brochures came out, I learned much about Langley that I had not previously known. It caused me to visit some places in the community and spend some money. Are these local trips, spending and weekly "Fresh Sheet" promotional success accounted for in Tourism Langley's reports? No. If one visits the Tourism Langley's Visitor Centre on the perimeter of our Langley Event's Centre, you will be greeted by Langley branded clothing, gifts, books, maps, local products and more. It's an awesome place for visitors to explore. I say Tourism Langley is a hub for all things Langley. Whether on the website or at the Visitor Centre, we need Tourism Langley to promote, cheer and point the way to visiting Langley and all that our community has to offer. We never know how many people will be reached with our message, nor how much dollars will be injected into our local economy. Sometimes the value is found beyond the statistics. Tourism Langley helps provide the ENDLESS CHOICES that Langley offers to the world. With the new year on hand, Tourism Langley has published a new report called “Taking a Closer Look” which is a 5-year review of the organization which they presented to the City of Langley on Monday. 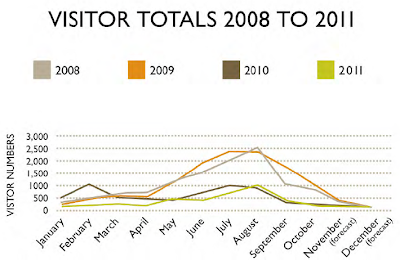 What I found interesting about the report is that year-over-year revenue has been on the decline as have the number of visitors that have used their tourism office. Many in the community have questioned whether Tourism Langley is an effective organization to promote tourism in the community. I found this letter to the editor in the Langley Advance. -that it "grow tourism" - It has not grown. 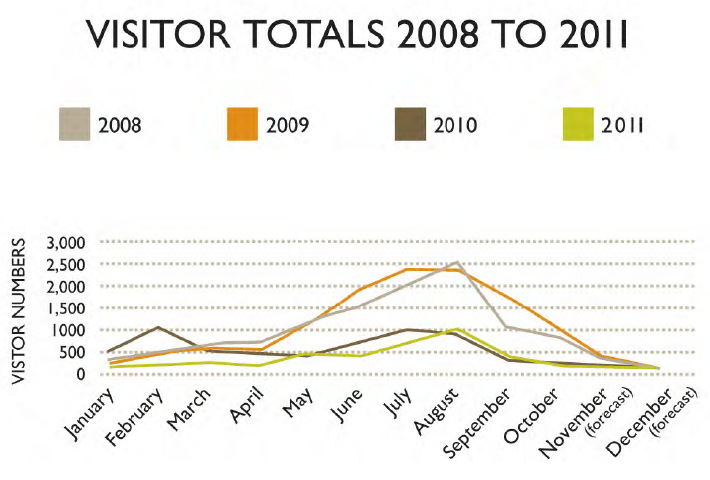 -that it "increase visitor revenue" - It has not increased. -that it "facilitate tourism relationships within the community" - Is Angie Quaale's letter an example? -that it "provide quality service to tourism-related businesses" - The 20.3 per cent decline in tourism does not qualify as "quality service" (remember 2010 was the year of the Olympics; there should have been a huge increase, at least in 2010). While we have been in one of the worst economic periods in recent history, I also have to wonder if Tourism Langley is the best way to attract tourist and their money to the community if this letter is indeed true. I have to say that Tourism Langley's own report painted a bit of a bleak picture for tourism in Langley. 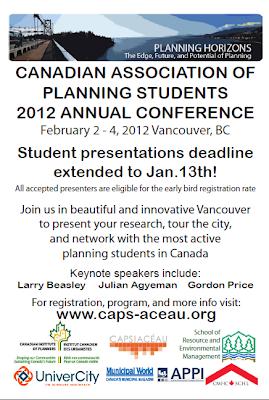 The national CAPS-ACÉAU conference is the premier event for planning students from across Canada. 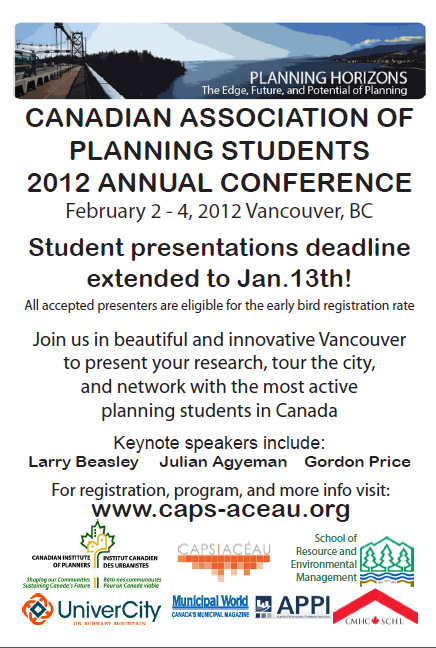 Join us in 2012 in the beautiful and inspiring setting of Vancouver, BC for a three day conference to share your research and projects, network with planning students and professionals from across Canada and the Pacific Northwest, and explore leading planning initiatives in the Greater Vancouver region. Keynote speakers include: Larry Beasley, Julian Agyeman, and Gordon Price. See our complete program online. On Saturday, I took a transit trip to visit my friend Daan van der Kroon to get a tour of some of the areas in Abbotsford that have potential to become mixed-use, transit-friendly, walkable, and all that good stuff. 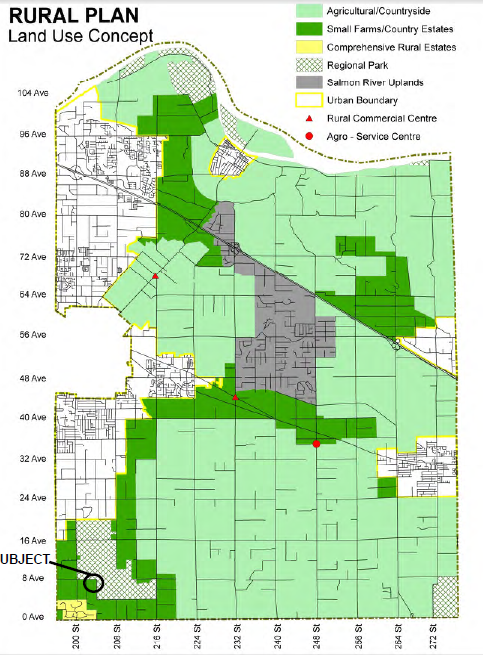 As you can see on the following map, the City of Abbotsford is planning for something they call the horseshoe which is a corridor that runs from the airport to the University of the Fraser Valley. Inside this corridor is where they plan on building an urban community. The Core Horseshoe in Abbotsford. Yellow is single-use housing. One of the first things I noticed was that there is lots of development potential in the corridor as many of the buildings are nearing the end of their useful lives and are in a state of disrepair. McCallum Road and Abbotsford’s Historic Downtown areas are probability the best examples of areas that are ripe for redevelopment. The good news is that they are starting to be redeveloped with quality projects though the main problem is that outside of the horseshoe corridor, it is suburban business as usual. 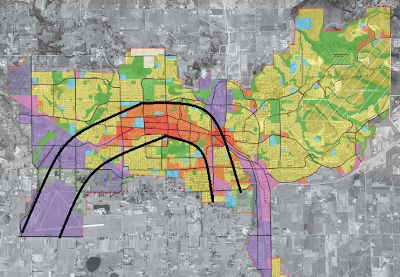 In fact the whole eastern side of Abbotsford (which is almost half the city’s “urban” space) is complete unsustainable and requires an automobile to get around. I have to wonder if this kind of sprawl is slowing down development of the urban core of Abbotsford and is therefore affecting Abbotsford’s overall path to sustainability. With so much redevelopment potential in the core, why is Abbotsford so committed to developing up the Sumas mountainside unsustainably? The following slide-show outlines the development potential and examples of good projects in Abbotsford's core. Abbotsford is a city in transition though I fear that the city’s eastern area is limiting its potential to be a truly sustainable community that balances urban and rural. Over the holidays, I had a look at the recommendations out of the Select Standing Committee on Finance and Government Services and some of the recommendations should sound an alarm bell for sustainability in the South of Fraser. It looks like the carbon tax is pretty much going to stay at its current level and will be capped at the rate as of July 2, 2012. While this might sounds good, this is really only the half-way point for where the tax needs to be at to be effective. What’s actually alarming is that the committee is recommending that cement producers be excluded from carbon tax. Cement production is a huge contributor to GHG emissions in Metro Vancouver. They also want to exclude agriculture from carbon tax. A submission was received from the Urban Development Institute discussing the impact of the Metro Vancouver Regional Growth Strategy on urban development. The Institute expressed concern that the strategy will be a serious impediment to development since each parcel of land is assigned a regional land use designation – in addition to existing municipal zoning. This regional land use designation would need to be changed in order to proceed with development for any other use. The Committee heard how this adds another layer of land use planning, which will impose greater costs and uncertainty on developers. The Institute was also concerned that the Metro Vancouver Regional Growth Strategy could potentially limit growth of the Pacific Gateway by preventing additional industrial lands near the Delta Port from being developed. Work with UBCM to ensure a conflict resolution mechanism is in place to protect the province’s investments in the Pacific Gateway. -In 2011, the “Serenade” and “Blu” Multi-Family Residential Buildings were completed in Downtown Langley and the “Varsity” on Fraser Highway is now under construction. The only thing that stuck out as an odd highlight was the car dealership as I don't know how that contributes to the Downtown Master Plan and creates a walkable community. It's basically a fancy strip mall off the Langley Bypass. The development even turns it back on Glover Road which is a huge faux pas in creating walkable space. 2012 will certainly be an exciting year as the Master Transportation Plan is due for an update and McBurney Lane will hopefully get a face lift. Of the course the biggest challenge for the City will be getting its aging infrastructure in the Downtown area upgraded to support the Downtown Plan.